HMS CATTISTOCK is one of the 'Hunt' class Mine Countermeasures ships of the Royal Navy, and is based at Portsmouth. Built by Vosper Thorneycroft in 1982, this vessel is built, like her sisters, of glass reinforced plastic, and is one of the largest warships built using this material. 60 metres in length, CATTISTOCK can steam at around 15 knots. 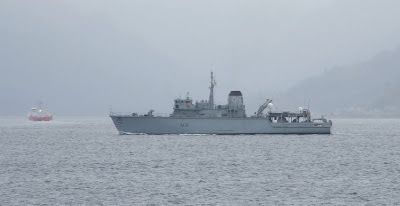 Not only used as minehunters and minesweepers, the class also serve in a Fishery Protection role in waters around the coasts of England and Wales. OCEAN LIGHT outbound - at last! VELAZQUEZ - another grey ship!